Chihuahuas! Why do we love them so much? Besides the fact that its impossible not to, these are devoted companions for life. Sure, some are more…restrained…than others when it comes to dealing with strangers, but when you become a Chihuahua owner, you’ve got a best friend till the end.So how do we make the most informed, healthiest, and yummiest choice when it comes to food? Read on! What’s In The Best Chihuahua Puppy Food? 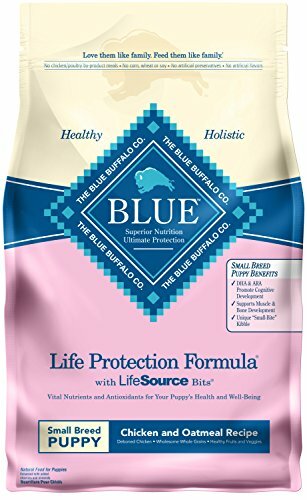 Chihuahua Dog Food: Should I Pick Wet Or Dry? Help Me Find The Best Dog Food For Chihuahuas! What are the Chihuahua puppy food facts about hypoglycemia? What are some games I can play with my Chihuahua puppy? 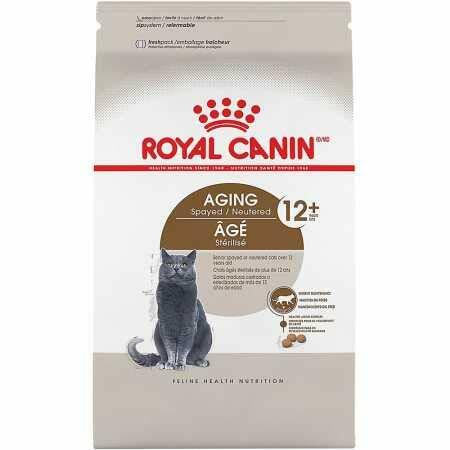 Royal Canin –This brand knows their breeds, that’s for sure! They create a huge array of lip-licking recipes for different purebreds, including some of the best Chihuahua puppy food on the market. We review the best specific Chihuahua foods a little further on, but feel free to head on over now if you can’t wait to see what’s for dinner! Our very tiny Chihuahua pups are going to be growing very fast—with only around 6 months between weaning and the switch to adult food! To make sure your Chihuahua puppy food is giving him enough energy, look for something with about 50 calories for every pound of body mass. Because they’ll need to build bones, muscle, and get that little bit bigger, try to feed them about 28 to 30% protein, and 17-20% fat. You’ll be doing your best friend a big favor if you choose a food that also features veggies, as these are a nice source of the minerals and vitamins that keep them healthy. Don’t forget to give your little one lots of water, too! Now how about we take a look at what’s inside the best dog food for Chihuahua grown-ups? Once your Chihuahua reaches around eight months young, he’ll usually start to require less in the way of growth-related ingredients. Your focus will then be providing a balanced mix of nutrients for maintaining a healthy weight. Starting with protein, something around the 25 to 30% range is usually spot on, and adults will require around 35 to 40 calories daily for each pound that they weigh. As is the case with all puppy and dog foods, the best Chihuahua food will have genuine, boneless meat heading the ingredients list. Try to scout out brands that also have authentic and natural sources of lipids/fats, such as chicken fat. Percentage-wise, aim for a figure around 13-15% fat— more for super active Chihuahuas, but probably not much less even if your dog is quite sedentary. If you can’t remember these figures all at once, that’s fine, too. We have a Dog Food Calorie calculator that you can check out. Use it along with the serving recommendations on your Chihuahua food bag to figure out how many calories to give him or her a day. Remember, active dogs will always need more calories than those who don’t tend to be active, so you may need to tweak these figures a little. While we stick to human food ourselves, we pride ourselves on being pretty clued-up when it comes to doggy nutrients! If you want to ensure that your Chihuahua’s getting all the goodness he really needs, there are a few extra things to keep in mind when you’re picking out his dinner. Joint care – extra small dogs (Chihuahuas included) require glucosamine as puppies; as a smaller breed, they can be more vulnerable to developing hip dysplasia. This often extends to a need for the same when they reach adulthood, so the best dog food for Chihuahuas will add this in. Look for either fish oil, or head to the guaranteed nutrient section to find out whether your Chihuahua food includes glucosamine. Bone health – Chihuahuas require an optimal balance of the well-known calcium and its partner phosphorus. Aim for about 50mg calciumper kilogram of your pup’s weight to prevent brittleness, osteoporosis, and keep your best friend’s bones as strong as can be. Hypoglycemia– Your dog needs to be fed several times daily. As a puppy, your Chihuahua will require even more frequent feedings, sometimes even around 5 to 6 meals each day. This is particularly critical for Chihuahuas, who have incredibly speedy digestive processes. If they go too long without food, they can suffer from sugar shock. With his recommended daily calorie intake in mind, pick a food that is suitable for several daily mealtimes in terms of k/cal per cup. Last, but definitely not least, your special fluffy friend always needs vitamins and minerals. When you pick out a food that includes vegetables or supplements in the ingredients section, browse through and see that they’re getting their recommended daily amount of A, K, E, C, D, and B vitamins. We like to recommend that owners choose the food that suits both them and their fluffy friend. If you find that wet food is a little costly to keep feeding your pup over long periods of time or goes off in the fridge too quick, you may want to mix it up with dry food. The good thing is, you can do this either by switching between wet and dry each mealtime or even mix the two together in one bowl! If you’re unsure about whether to give your pooch a dry or wet Chihuahua food, you can try out both and see which he takes to more. We know that Chihuahuas, in particular, can be a pretty picky breed, however, so one note. If he doesn’t seem to be eating his kibble, but he guzzles down wet food like there’s no tomorrow, check that you aren’t feeding him food with too-large kibble sizes. Chihuahuas have small teeth and tiny jaws, which is why the best dog food for Chihuahua puppies is gonna have carefully designed kibble to match. Your tiny little ball of love depends on you to give him the best possible diet. We’ve looked at the basics of choosing the best food for Chihuahua puppies, as well as the best brands. So let’s review our team’s top picks and find out which recipes offer the yummiest, healthiest possible dinner for your tiny friend. With Nutro, you always know that your pup is going to be eating really great, natural ingredients. Time and again, we’ve also heard dog owners talk about how their pets seem to love Nutro’s tasty flavors! We love that Nutro always places real and natural meats at the top of every single ingredient list. This ain’t an exception— you’ll find boneless, tender chicken as the starring protein here! With 25% protein, your tiny little one is off to a brilliant start. 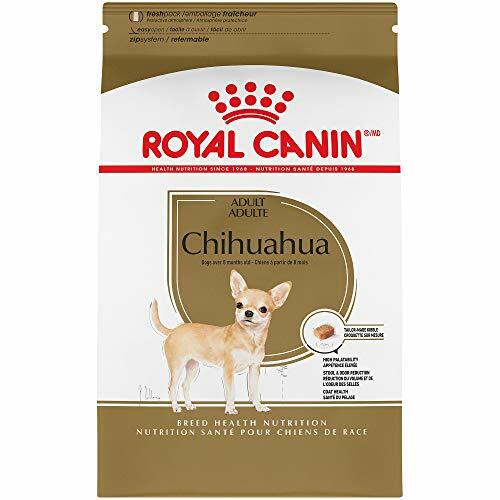 It’s priced somewhat higher than some other Chihuahua puppy foods out there, but we think it’s well worth it. 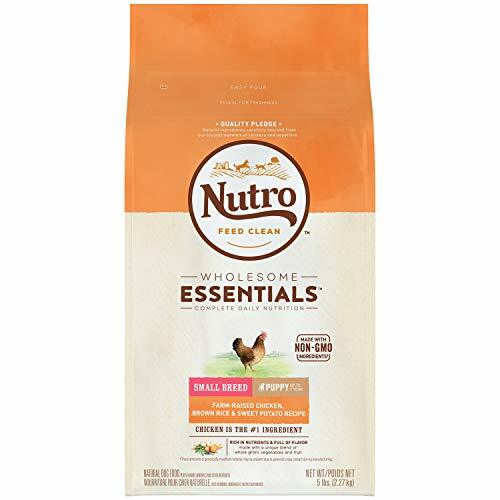 Nutro Wholesome is exactly that—wholesome! If you want to give your puppy some natural vitamin-containing food sources, look no further. Zero chicken-based by-products and contains no soy proteins, maize, or even wheat. We adore it. If we had to eat five times a day, we’d want something as healthy and mouth-watering as possible. 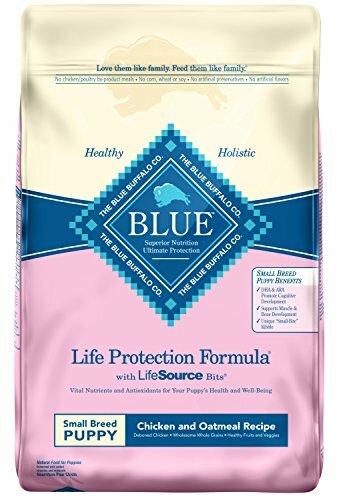 With this Blue Buffalo Life Protection recipe, your Chihuahua best friend is guaranteed both. We like that it features antioxidants for immune health and that these come naturally from flaxseed. If you choose a smaller bag, you may find that you’re buying it fairly frequently. But is that really a downside? Designed for Chihuahua puppies of between 8 weeks (aw!) 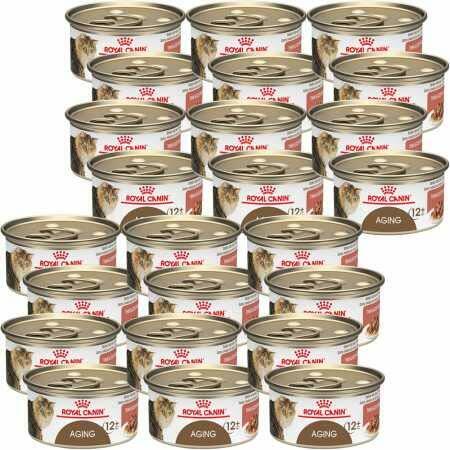 and 8 months, this is food for Chihuahua puppies that are especially for fussy pups. It’s got tiny little kibble bits, making them simple to crunch up and chow down at a gentle pace. This formula’s developed exclusively with our tiny little Chihuahua friends in mind, meaning extra thought has gone into its mini kibble structure—every last bite! E Vitamins are a good way to help prevent your little pup from getting scratchy, itchy skin, as well as maintain a strong immune system. Calibrated fiber content within this recipe means that when they go to the bathroom, you probably won’t need to hold your nose so tightly! Tasty chicken is always a big hit with most pups, small and large! This does contain some assorted by-products. On the plus side, they’re rich in protein. We think that chicken’s a winner every time, so that’s one big pro. As well as this, if you’ve got a picky little pup or one who has a hard time with regular small-breed puppy food, the cute little kibble pieces are perfectly crafted for tiny mouths. Meaning little Chihuahua pups can pick them no problem, making less mess around their bowls. They’re so loyal and loving, and no less cute when they reach adulthood. They will, however, require less protein, as discussed. Here are the recipes to look out for when you’re after something balanced and complete for your Chihuahua friend. Yep, you guessed right! Just like they hit the nail on the head with their Chihuahua puppy food, Royal Canin has made a super dinner formula (and breakfast, and lunch…) for your grown Chihuahua. Why is it some of the best dog food for Chihuahuas? Let’s see! Like the puppy version, it does include various by-products. This makes a nice dinner for Chihuahuas, and it’s reasonably priced. Another good thing, we’ve found, is that other toy breeds seem to love it, too. So while you may have already bought your Pom his own special dinner, at least we know it’s yummy! 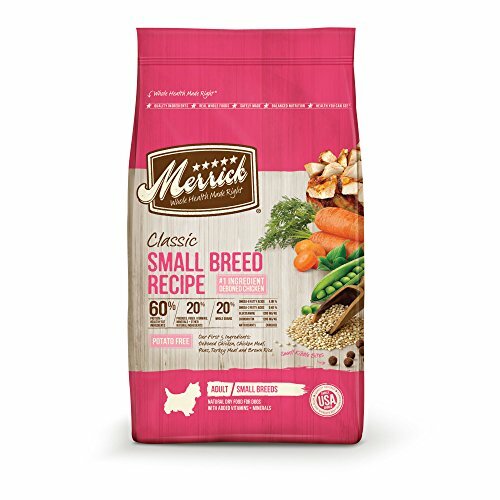 Boneless, high-grade protein from succulent chicken is the key protein ingredient in Merrick Classic for small, but grown, dogs. And that includes Chihuahuas—this is not only made without any corn or soy but also skips the potatoes for more sensitive dogs. All the multi-coloured goodness—Vitamin B2, B1, C, fiber, potassium, and more—of sweet potatoes. Nope, this is one of the best dog food for Chihuahuas! Merrick is frequently recommended by doggy vets because it offers balanced, well-rounded nutrition. Even the pickiest little Chihuahuas will fall head over heels for this chicken feast. And, it’s got an awesome 30% protein! Pumpkin and sweet potatoes round out this sumptuous chicken recipe for all grain-free small dogs everywhere. If you’ve got yourself a gluten-intolerant Chihuahua, here’s why you might want to give Nature’s Recipe a go. Specially designed with little kibble bits for our small-breed friends. 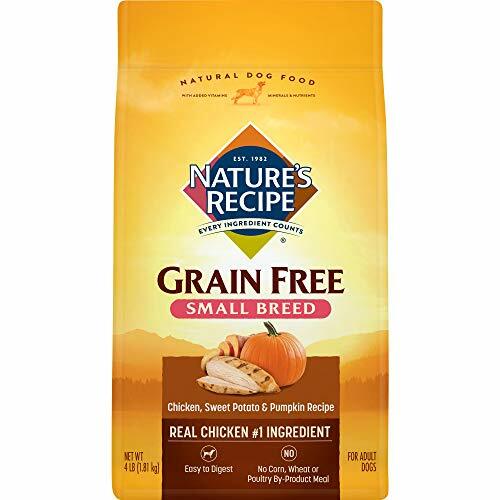 We are so happy to have found Nature’s Recipe, as it’s completely safe to feed to pets on a grain-free menu plan. They love the carefully developed kibble size, and it’s got a stellar selection of different protein-based ingredients for diversity. As small little dogs, and as even smaller little puppies, Chihuahuas have got a super-fast metabolism. Next time you pick up your mini best friend, take note of how fast he’s breathing—it’s because their systems are very rapid to digest and break down even special dog food for Chihuahuas. This means that they can sometimes tend to burn off the calories from their food before their next mealtime. When this occurs, it’s known as hypoglycemia, and can lead to spasms, trembling, or fainting in serious cases. The best way to help your pup is to feed him frequently with special Chihuahua puppy food or a small-breed recipe. Aim for at least five feeds a day with puppies. 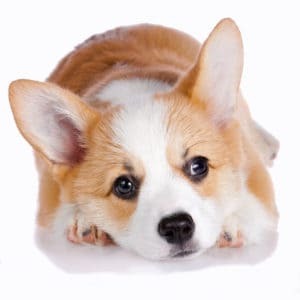 The best dog food for Chihuahua puppy and adults alike will also be higher in energy per unit than regular dog food, which helps to them going between each serving. Tug of war– this game works so brilliantly with a small rope toy, but you can use your pup’s favorite sock, glove…or whatever it is! Just wave the toy before your little puppy and he’s sure to grab it eventually. Then, gently pull it back and forth. The fun part is letting it go once in a while, which will make your puppy feel like a champion. ‘Rolling’ fetch – designed for our mini, tiny bundles of love, rolling fetch is simply a toned down version of the game for bigger dogs. Choose a ball or toy that will fit in his mouth. Roll it gently across the floor or toss it a small distance across the room. Don’t expect him to understand what’s happening right away, but praise your little puppy for bringing the toy back to you when he finally does. He’ll love it! If you’d like to find more games and activities for your Chihuahua, head over to our special Tips page!